Eating healthy, less of a priority for many in their youthful years, becomes all the more necessary as the risk for heart disease, high blood pressure, Alzheimer’s and other age-related conditions increases as you get older. 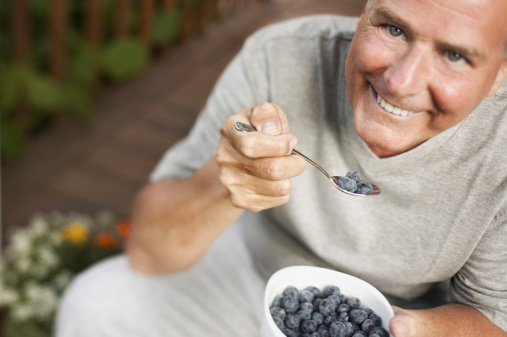 Ideally, eating habits that support healthy aging should start “in your teens, if not earlier,” said Adriane Kozlovsky, MS, RD, LDN, a clinical dietitian at Levindale Hebrew Geriatric Center & Hospital. These fruits contain antioxidants that can protect the brain from oxidative stress and may also help reduce the effects of age-related conditions like dementia. “With fruits and vegetables, the darker the color, typically the higher the nutrition content,” Kozlovsky said. This is also a great source of antioxidants, though it’s recommended that you not exceed 8 to 10 grams of sugar per serving. “It’s all about the oxidation. It’s all about making sure that those arteries that lead to your heart or to your brain are clear and healthy,” Kozlovsky said. Whole grains contain fiber (which supports heart health), vitamin E (which can help minimize oxidative damage), and some omega-3s (which also support heart health). Remember, whole foods in general are always the better dietary option. “The less processing, the less refining, the better,” Kozlovsky said. LifeBridge Health advocates preventive, wellness and fitness services as well as educational programs. ← Can Stroke Drug Also Prevent Alzheimer’s Disease?